Before discussing how to play Vampire Wars, new players should start out with a few stats that help put the game into perspective. 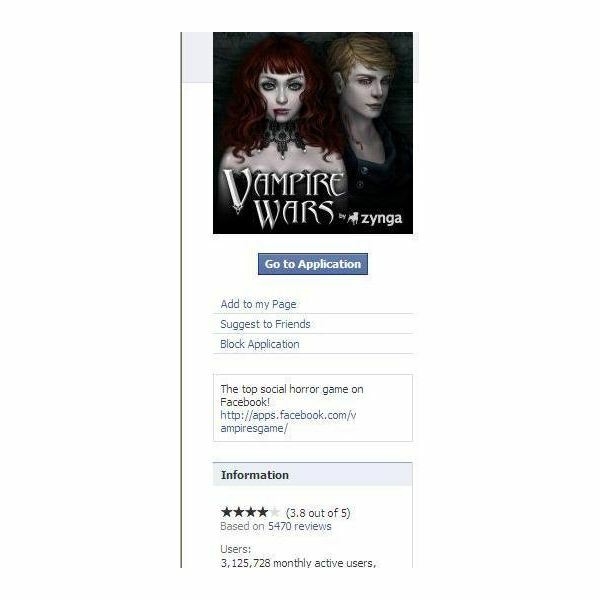 Created by Zynga, Vampire Wars currently ranks 36th among the Facebook game applications; as of February, 2010, it boasts about 3,125,478 active monthly users. The game’s Facebook fan page at present has 900,219 members and displays a game user-rating of 3.8 out of 5. The objective of the game is simple: build a vampire avatar and imbue the character with sufficient strength, stamina and abilities to fight and beat weaker vamps. Blood is the coin of the realm. Players obtain it by doing jobs, winning in combat and siphoning off predetermined hourly amounts from minions. To get minions, the player must have sufficient blood to pay for them. This places the primary emphasis on the missions and on combat. There are eight mission tiers. Beginners start out as a fledgling and move on to become a neophyte, adept, savant, stalker, deathbringer, vindicator, scion, reaper and finally arrive at nightshade. Each tier is broken down into individual jobs. For example, the fledgling tier has seven separate jobs. Each job must be completed – in its entirety – on three levels; this entitles the beginning vamp to refer to herself as a ‘fledgling,’ ‘greater fledgling’ or ‘superior fledgling.’ This designation continues throughout each mission tier. Each mission requires a predetermined amount of energy and abilities. Concurrently, each provides the player with a blood unit payout range and experience points. The beginning vamp must upgrade her abilities by visiting the bazaar section and buying the required amounts of fangs, claws and other items. Be cautious of overbuying too early! The majority of these abilities have blood-unit upkeep, and it is imperative to have sufficient hourly blood-flow to sustain owning them. Until the player reaches an intermediate level, she will only face rivals within the same general level and strength bracket. Win at combat and the rewards are blood units, experience points and occasionally also rare abilities as well as skill ranking points that boost an avatar’s power. Lose, and the character forfeits blood and skill ranking points. Playing it safe when in combat and building a clan helps with becoming a gradually harder to beat force in the vamp world. Building a clan is directly tied to the number of Facebook friends the player has. Within the game of Vampire Wars, each vamp may draw on the strength of a maximum 501 players. The game randomly chooses the vamps that will throw their skill levels behind the combating vamp, and it is beneficial to build a clan that has numerous intermediate and advanced level vamps, rather than merely looking to beginner level vamps. Clan members cannot attack each other; this protects the beginning vamp from being attacked by another vamp that outranks her. The new clan member is at least somewhat stronger than the beginning vamp and therefore will strengthen the new vamp’s overall attack and defense power. Combating vamps are active players; active players send gifts – usually abilities that do not require upkeep or consumables for intermediate missions – and short-lived strength and energy boosts. The general consensus suggests that a gamer should friend the player on Facebook and include “Vampire Wars” or “VW?” in the comments field. One of the most commonly made mistakes by newbies is to simply log off when the energy or rage runs out. When coming back the next day, the fledgling vamp is disappointed to find her hard-fought blood seriously diminished and her skill ranking decreased as well. The error is simple: the player logged out without banking blood and going into zombie mode. Banking blood places the blood units – minus 10% — into a blood bank where it is safe from being raided by other vamps. Simply click on the blood and then opt to ‘deposit’ the blood units. Learning how to log out of Vampire Wars — zombie mode – is easy as well. Simply combat with other vamps until the health runs down to below 20 and as close to one as possible. Finishing combat by attacking a slightly higher level vamp achieves this goal easily. Going below 20 health units protects the player from being hit-listed and also takes her out of the general combat field. As a result, skill ranking and blood income are protected. The appeal of Vampire Wars rests in the changes that take place as the player progresses through the game. For example, as soon as the fledgling vamp starts to become more acquainted with the game, she must have skills that may be purchased alongside consumables that may be won or gifted. This begins with the neophyte missions and continues all the way through the scion tier. Stay tuned for a Vampire Wars tutorial that addresses the needs of the intermediate to advanced player. It also reveals some strategies that will set the gamer with a mid- to large-sized clan on the road to success.